The volume flow controller is a mechanical self-powered unit and works without external power supply. A damper blade with low-friction bearings is adjusted by aerodynamic forces such that the set volume flow rate is maintained within the differential pressure range. The aerodynamic forces of the airflow create a closing torque on the damper blade. The bellows expand and increase this force while at the same time acting as an oscillation damper. The closing force is countered by a leaf spring that unrolls over a cam plate. The shape of the cam plate is such that a change in the differential pressure leads to an adjustment of the damper blade in a way that the volume flow rate is maintained almost exactly. 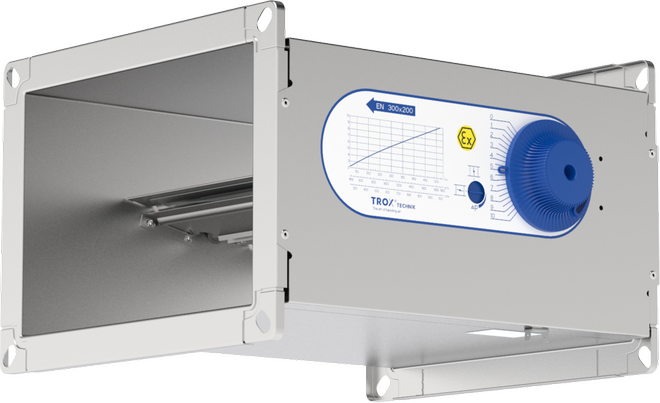 As a result, the volume flow rate remains constant within narrow tolerances. Ready-to-commission unit consists of the casing containing a damper blade with low-friction bearings, bellows, external cam plate and leaf spring. 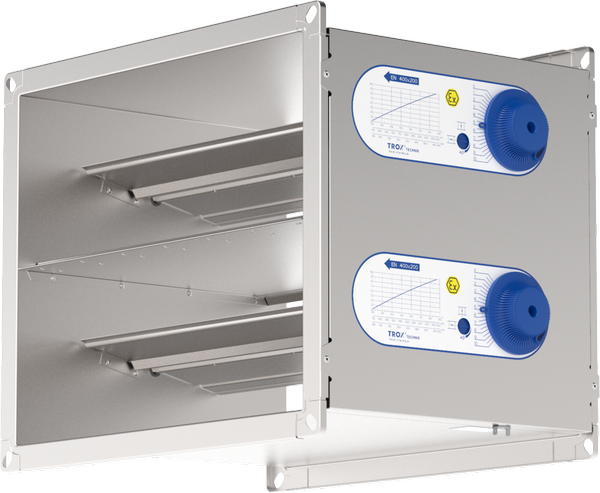 The volume flow controllers are factory-adjusted and preset to a reference volume flow rate. Sound power level measured according to DIN EN ISO 5135. 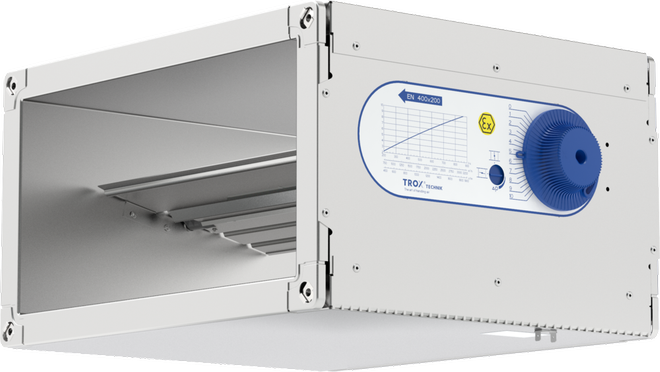 Meets the hygiene requirements according to VDI 6022. 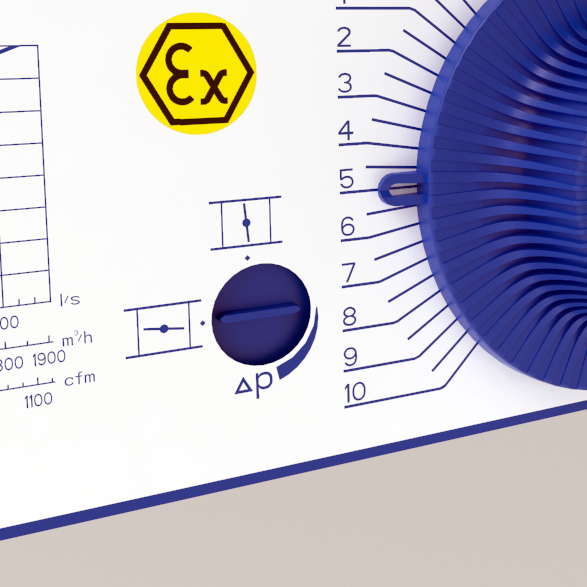 Meets the requirements of ATEX Directive 2014/34 EU. The volume flow rate accuracy Δqv applies to straight upstream. Bends, junctions or a narrowing or widening of the duct cause turbulence that may affect measurement. Duct connections, e.g. branches off the main duct, must comply with EN 1505. Free air intake only with a straight duct section of 1.5B or 1.5H upstream. Sufficient space must be clear near to allow for commissioning and maintenance. If necessary, inspection openings of sufficient size are required.